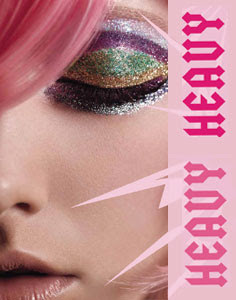 has signed on to be the face of one of my favorite make up lines, Urban Decay. Speaking of fashion, remember my earlier post about working with a super cool designer? 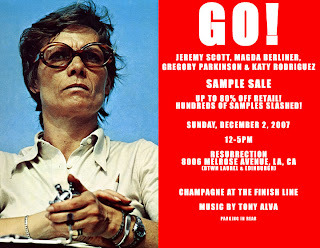 Her name is Katy Rodriguez, and she's having a sample sale on Sunday along with some other cool designers (Jeremy Scott!). I'll be there, and you should be too! Lily Allen looked absolutely stunning at the British Fashion Awards Monday night. 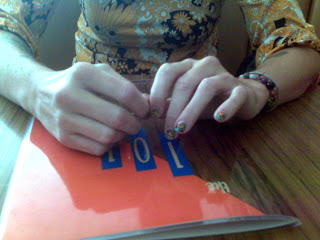 Her nail varnish (which is already making headlines and is apparently only on one nail) is "Yell-Oh" by Color Club. If you've been reading my blog lately, you know how much I am loving mark. cosmetics. Last night I was surfing around the net and I came upon a site for mark. reps called markgirl.com. I was pleased to find some really great instructional videos on the site! 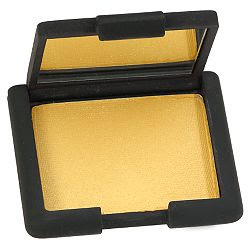 They demonstrate some simple, easy to follow techniques for creating flawless skin, smokey eyes, a liquid eyeliner look, and a red lip. Usually when I see a make up demonstration I get kind of bored, and my mind wanders. I was so interested in these videos that I literally spent half an hour watching them. Click here to do a little Holiday shopping, and get free shipping on mark. products. Cory Kennedy has moved her blog. Check it. In unrelated news, Bust Magazine <3's Lily! I had lunch with my friend Ashley today. Check out her air brushed nails! What a cool idea! Soooo cute!!! About a month ago I found this really cool clothing line called Made Me. I found out about the line when I read about the designer on the NYLON website. I love to wear mens clothing (jeans, vests, jackets, even mens shoes) but, of course, add my own feminine flirty flare to it, so when I read the line “I have always found power and attractiveness in women that dress with a masculine style.”, I knew I had to check it out. They came in the mail on Saturday and I was seriously so impressed that I emailed Erin, the designer just to say thank you! (I know, I'm such a dork!)... And she emailed me back! So cool! I wore my Virgin T yesterday and when I was at Perez Hilton's office (aka The Coffee Bean on Sunset and Fairfax) waiting for my second Americano of the day, this very stylish older woman that looked like Debbie Harry flashed a huge smile at me and said "I love your shirt". I grinned from ear to ear and said "thank you" and my heart danced around in my chest a little. Erin also sent me a sneak peek at her Spring line and I'm totally dying over it! Here's a little peek for you! P.S. 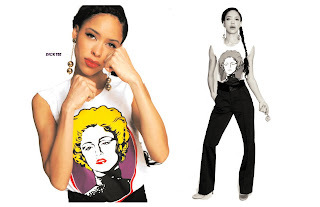 Could that model look any more like Sade? LOVE! Uh oh, new obsession alert! 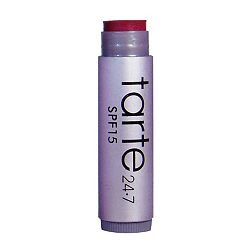 Today I was on a shoot with a super cool designer (more on that later), and she had this great lip stain with her! It was a great natural color that really stayed put! It also has SPF which is wonderful. Most stains tend to crease and settle in the cracks of your lips (and kind of look like you've been drinking Hawaiian Punch! ), but not these! There's a color for every day of the week and I want them all! Since most bloggers are doing their Holiday shopping posts, I'm going to tell you some of my favorite indie spots to shop in LA. First and foremost, The Beauty Closet. This is the best little make up store in the Valley (possibly the planet), carrying all of my favorite high end beauty lines. I find some really unique t-shirts and vintage items here! Another great place for cool t-shirts! I'm a sneaker freaker! I love cool trainers but I have tiny feet! Usually I can't find the coolest ones in my size because they are only in mens sizes and my foot is actually a boys size. Kendo is a shoe boutique for women and I'm obsessed! 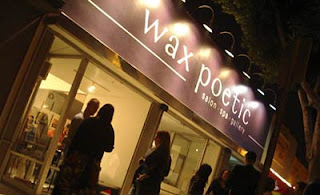 Buy a gift certificate for a beauty treatment, or shop their boutique. 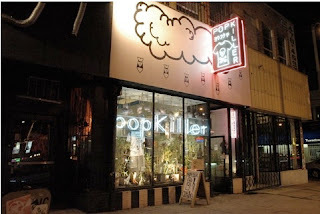 Lots of cool art, books, and beauty products. 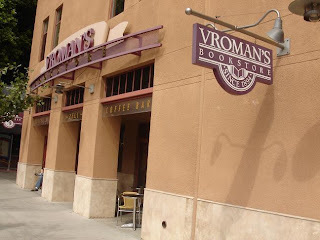 This store has been in Pasadena since the 1800's! (How crazy is that?) It has everything the big book retailers have plus really cool gifts. 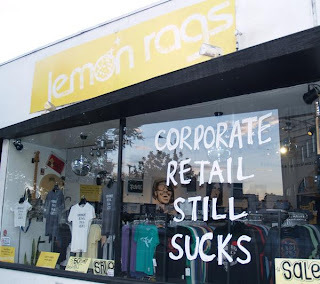 High end lingerie in Silver Lake. 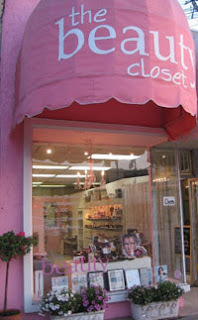 Cute, cute store! I would love to hear about your favorite indie spots! Leave them in the comments! We were sooooo separated at birth! Everyday Should Be A Holiday! The Holidays are officially in full swing, and every holiday party dress needs a dramatic piece like a chunky cocktail ring! NYLON is obsessed, and so am I! I've been wearing this cute cocktail ring by mark., (they do more than just great make up!) and I get a ton of compliments on it! They've got some other cute rings that I'm totally dying for too.... Check them out! So cute, so affordable! Love love love! and do these nails yourself with For Audrey by China Glaze. But since you're not, I got you a present. Tomorrow only, so don't forget! 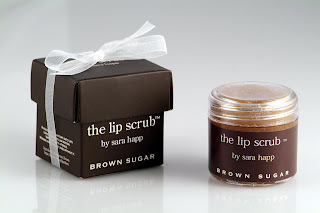 My latest obsession is The Lip Scrub by Sara Happ. 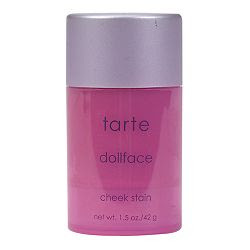 I picked it up over the weekend when I went to The Beauty Closet, and I'm ADDICTED! 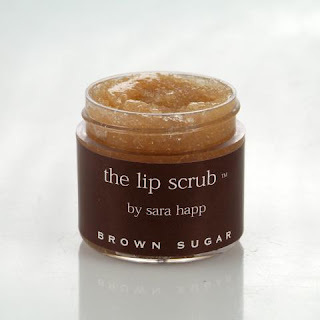 I used to use a toothbrush to exfoliate my lips, but not anymore! This is just too perfect! I rub it on in a circular motion and then wipe it off. (Ok, who am I kidding... I lick it off. It's made of brown sugar! Sooo yum!) It keeps my lips feeling really really smooth! 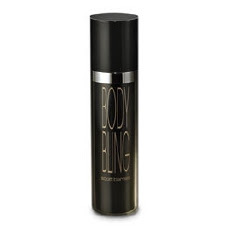 It comes in a bunch of different yummy flavors like Brown Sugar, Vanilla Bean, Cocoa, Cinnamon Sugar and Peppermint! My favorite is Brown Sugar. 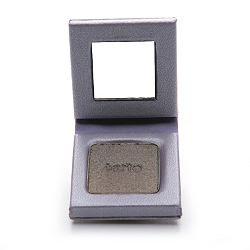 The packaging is sooo to die for that it would make a great stocking stuffer! Sorry for the tech diffs this morning! 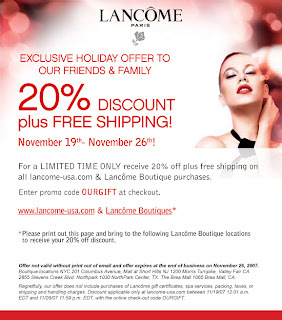 My friends at Lancôme have asked me to share this with my friends, and you guys are my friends, right? Sounds like a great time to stock up on some Hypnôse!!!! One of my favorite things to do as a make up artist is music videos. They are long days and a lot of hard work, but you usually get to be really creative. Making the post about Corinne Bailey Rae at the Grammys made me think about a really cool video I did with her. The song is called I'd Like To, and you can watch the video here. I was so excited when I heard the concept of the video because we got to start with a glammed up fashion look and by the end of the video her look is very natural. We had a great time, and if you look closely you can spot me during the BBQ scene (Corinne didn't think there were enough extras, so she had me jump in!) You can also spot my favorite sunglasses on one of the extras! The American Music Awards were last night and it was a reminder to me that the Grammy nominations will be announced next month. Last year the Grammy's were a whirlwind experience. 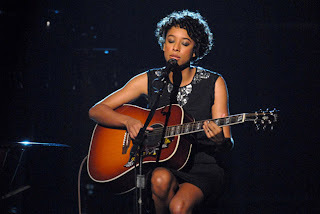 A client of mine, Corinne Bailey Rae was nominated for three awards. Although she did not take home a trophy, it was amazing to create her red carpet and performance look. This is Corinne on the red carpet. For The Love of Make Up did an excellent piece on how I created the look, so check it out (under Feb '07)! After some of the awards were announced, Corinne met me back stage for a quick bump up on the eyes, and then gave an amazing performance! Her look got rave reviews from beauty critics everywhere, and I'm sure there are many more Grammy nights in Corinne's future! Also, can somebody please give me the number of Miley Cyrus' dentist?! Her new smile looks amazing!